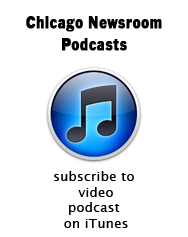 Wanna spend a half-hour talking about the Illinois budget mess and the neutron-bomb that is the Illinois pension situation? No? Who could blame you? But this conversation’s a little different, because it’s with a guy who was there. For pretty much the whole thing. A reporter who covered the Thompson 3% compounded COLAs, the Edgar Ramp, the Ryan Buy-Out. 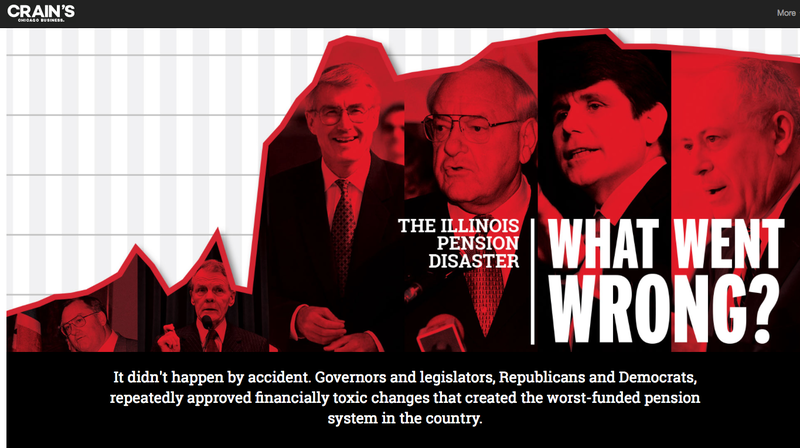 The Blagojevich borrowing and the Quinn/Madigan “pension reform” that got killed in the Illinois Supreme Court. And the unions who went along with it all. And the City officials who accessed the money to build new, gleaming schools and maybe pay off a few of their own pensions. Dave McKinney tells us that, in essence, nobody who ever got involved with the pension mess has clean hands today. For 19 years, McKinney covered the goings-on in Springfield as the Sun-Times Springfield Bureau Chief. He’s not with the S-T any more, but in recent weeks he’s done some excellent work for Crain’s and for Chicago Magazine, in which he laid out the whole sordid 30-year history of under-funded pensions – and he attempts to pin a letter grade on Bruce Rauner. No episode of Game of Thrones to House of Cards has ever depicted the level of deceit, ignorance, pandering and raw power-politics as this. And the best part? The folks who make these decisions know they won’t be around a generation later when the bills come due. Ladies and Gentlemen, we present a full, unedited transcript of today’s conversation. Ken: Dave McKinney for the first time is sitting at our table and I am thrilled to have you here, David. Good to have you. Ken: So, there is a vast amount to cover, but I thought I would begin the program today by quoting you to yourself. Ken: This is from your Crain’s piece which we will talk about later. Ken: Are they getting little sweeteners to help them along? Dave M: Yeah. But in the end what we see is this problem getting worse every year to the point where now it’s crippling the state and will continue to do so for the next 30 years. One out of every four state dollars are going to be going to pensions. Ken: What’s most fascinating to me about this is the narrative of course, that we’re all asked to swallow, that the cause of all of this is those greedy teachers and cops and social workers and firefighters and all these public employee people who have caused this to happen. Now it may be that their leadership was complicit in it, but the blame is not there. The blame is in pandering politicians who in order to get re-elected are willing to throw these different things on the fire. This is the coolest thing of all, this piece in Crain’s. This is a graphic (copied above) that I’m sure you can’t really see all that well on television, but this is kind of where the unfunded pension is over the years and this is the Thompson years and so forth. Here, my friends, is the Edgar Ramp. Tell me about the Edgar Ramp. Governor Edgar is supposed to be one of the smartest and cleverest governors we ever had. How did he commit this to us? Dave M: Well this was a scheme… I called it a scheme, it was a plan that Edgar and House speaker Michael Madigan came up with in 1994. And at the time to their credit it was viewed as a responsible way to finally get this pension problem under control, because for years, especially under former Governor Thompson when it came time to put together a budget and X-amount needed to go to the pensions they would always short the pensions and put it towards schools or whatever else. And so in 1994 they came up with a plan that set out over 50 years to get these pension systems at 90% funding, and that involved basically about a 15-year ramp-up where these payments would gradually increase to the point where finally in the early to mid 2000s they would start going up. That’s the ramp part that has just thrown the state on its back now. Ken: But it’s important though from the way I understand your description of this, the next few years in 1994, those adjacent years when these guys would all still be in office, that ramp didn’t go up very far. It was pretty flat. Dave M: Well it was pretty flat and there were some who would say that was by design. It helped them manage a budget in the late 90s and early 2000s without having to commit enormous sums of money. But in the process, the Supreme Court opinion in May that tossed out Senate Bill 1 pointed to the Edgar Ramp as one of the main causes for our dysfunction. And effectively what those 15 years did, it shorted the pension systems what they were really owed. I mean in the mid to late 90s I think it was like about $600-million the state was committing to the five pension systems. You know now, this year we’re on the hook for $7.6-billion. Ken: So it’s fair to say that Edgar’s policies coughed up this hairball onto our carpet in the last few years. I mean that’s not an unfair statement, right? Dave M: Well I mean that ramp is what’s still in place. I mean every year we’re following the dictates of that ramp and what the dollar amount every year is prescribed at. But what Edgar would say and in his defense he would say that there were a series of actions after this ramp was put into place that changed the whole equation. Things like pension enhancements, things like the early retirement program you alluded to under George Ryan. Pension holidays under Blagojevich, these things should have necessitated that ramp being recalibrated and it never happened. Ken: But it wasn’t, so we ended up with it. I’m just so intrigued by all of the different levels on this. We kind of started in the middle but we really needed to start with the great Governor Jim Thompson, right, because Jim Thompson gave us the 3% compounded raises that we keep talking about. I mean everybody says these raises, if compounded, look what they’ve compounded to over the last 20-25 years. That was a Jim Thompson creation. Why? Dave M: It was something the Unions were pushing at that point. They wanted to basically do more to protect the retirement annuities of their members which is exactly what they should be doing. At the time, though I went back and I looked at the floor debate, this preceded my time in Springfield, but I went back and I looked at the floor debate in both the House and Senate and really nobody was talking about what this might cost. And there was only as I recall one legislator who stood up and said, “Hold on guys, this is going to really be an eye-opener once we get it in place. It went into effect anyway. Thompson signed it and a short time later there was an estimate that came out I believe in 1990 that said that the cost was about a billion-3 of this, and that figure has not been updated since then, but I would just about guarantee you that that number is way out of whack. It’s probably much much more than that. Ken: Now you got to interview pretty much all of these guys didn’t you? Ken: For this piece you wrote for Crain’s Thompson told you in essence I just had no idea it would be so expensive. Dave M: Well yeah, I asked him particularly if he remembered anything about this pension omnibus bill that came to his desk in 1989 and in particular the compounding cola. And he’s like, “I don’t remember the cola part, I just don’t. It’s been so long ago I can’t remember it.” But he pointed out, “If I would have known it was going to cost a billion dollars I would have vetoed it.” And so there’s the first example we have of somebody not having numbers in hand when they make a decision about something that winds up costing the state a great deal of money. Ken: And it is just the way of legislators everywhere. It happens in the City Council with the parking meter thing. When these big things come in they are given to you 12 hours before you have to vote. Most of these legislators let’s face it aren’t really sophisticated in these ways. They just look at it. The leadership tells them you’ve got to vote for this, they vote for it. Dave M: That’s right, and you know I found that time and time again that the numbers that were generated ahead of these either they didn’t stand up or the numbers didn’t exist at all. And you know if you fast forward from Thompson into the Blagojevich years I started this piece looking at a bill that passed in 2005 that allowed the state to skip two years of pension payments, make partial payments. Ken: With the City’s complicity. Everybody wanted that, right? Dave M: Well they wanted it. It was part of a bigger thing designed to save the state money on pensions. There were other things in there that took aim for example at school districts that would award school administrators late in their careers these massive pay increases and then the state would have to pay the pension based on those. So they aimed to cut back on that, but these pension holidays I was really curious about what did they cost? Because that wasn’t ever spelled out ever that I remembered. And so I went digging and I found that on the floor the sponsors of this legislation said the whole package would save the state about 30 or $35-billion. Well two or three months later the research arm of the General Assembly called COGFA they drew up some estimates that said that actually the whole thing was probably going to cost the state close to a billion dollars, and in particular these pension holidays along with clean-up from the Ryan period could wind up costing as much as $6-billion. Ken: It’s unbelievable. And we really have to talk about George Ryan and this early retirement plan thing. I worked for the City at the time and this was the big thing, and we can’t forget Mayor Daley’s role in this because he and George Ryan were connected at the hip. I mean they agreed on everything. And this was George Ryan’s idea which helped Daley unload a lot of people off the City payroll and George Ryan was doing the same thing with state payroll, right? Dave M: Well this was aimed strictly at the state. I mean this is something that both Ryan and Madigan embraced. When it came in late 2002 it’s a point if you remember it’s when George Ryan when his political career was really in ruin because of the license-for-bribes scandal and the federal investigation of him. It was clear at that point that the democrats had won the right to redraw the legislative boundaries and would take control of the legislature, and it was pretty clear that there probably would be a democrat running the governor’s office. And so all that being told, there were all these government employees that that had gotten their jobs under republican administrations – Thompson, Edgar, and Ryan. And what this packaged aimed to do was to give those folks a way out. It came at the time too, post-9/11, where there was a true revenue drain and they justified it saying look, if we can clear the payroll of 7,000 people it’s going to cut down our operating costs and thus save money. Never minding the fact that you know by putting those people under the pensions it was going to increase it. Ken: The people who are 55 years old and would be on it for maybe 40 years. Dave M: This allowed people to retire as young 50. What it did it proved so popular that the estimates were way off. You had people taking out home equity homes to buy enough service credits and time credits to get into this. And so this plan to knock 7,000 people off grew to like 11 or 12,000 and it wound up being about a $2-billion boondoggle for the pensions. Ken: I do remember – my view is more from the City side of course, but I know that I was working in the mayor’s office at the time and when that was proposed I was 50 probably, just a little over 50, and if I had been able to come up with $22,000 I could have bought whatever it was, however many years it was that would have allowed me to have retired at full pension. And nobody – nobody stopped to think about wow, is that going to cost our children some money somewhere down the line? It’s insane. It’s just absolutely insane the way it was being done. But as you say, in the state it takes on an even additional level of sinister-ness because it’s actually political. It’s like trying to save some of the folks that would lose their jobs otherwise. Dave M: I mean it had a twin purpose. And don’t forget I think everybody’s attitude about money at that point in time was a little different than it is today. Because I mean even though we had 9/11 and the revenues dried up after that, you know we were coming off the late 90s and the housing boom, and so people just thought that money was out there. Dave M: It would just all take care of itself. Ken: And I think Dave that is such an important issue to help put this in perspective, because it is true, in the late 90s and all the way into the 2000 era the tax revenues were going up like crazy. The housing boom was in its zenith and it was possible to kind of think it was going to go on like that forever. The same thing in your personal life right? If you bought your house for $150,000 and suddenly it’s worth $200,000 and you know that soon it’s going to be a quarter of a million dollars. Dave M: Oh exactly. When Edgar left office in 1999 I mean the state had a surplus of over a billion dollars. I mean contrast that with what we have now. Ken: So let’s also bring our beloved Governor Blagojevich into this because Blagojevich introduced this new concept of borrowing as revenue. It was like oh we have a huge hole, I’ll just borrow $10-billion that will…and it did, it staved it off for a couple of year didn’t it? Dave M: It did. They wound up putting I think about 7.8-billion of that 10-billion into the pension systems and almost overnight it changed the unfunded ratios from like 49% to like the low 60s. So for a couple of years you could see the effect of it, but then they used that spike upwards as justification then to get into that pension holiday thing that we talked about a little bit ago. And one thing I didn’t mention about that was that here we are, you know that pension holiday in 2005 winds up coming onto the laps of the legislators two days before adjournment, no clear-cut estimates on how much it’s going to cost. And then kind of the cherry on the sundae is there were so many things on the docket as there always are at the end of session that they limited the debate with a stopwatch to talk about what eventually could become a multi-billion dollar expenditure. So I mean that gives you an idea of government at work. Ken: I want to talk about a few other things in that, but this just takes me off on a little diversion. The now infamous 9% pension pick-up. When did that happen? Do you know? Was that before even Edgar and Thompson? Dave M: You know what, that one goes back a ways. I didn’t really delve very deeply into that one to be honest with you, so I need to spend a little time looking into the history. Ken: It’s been there for a very long time is the point. Dave M: Correct, it has been. Absolutely. Ken: Is it reasonable for the CTU to say taking whatever it is, 7% of that away is the same thing as a 7% pay cut? Is that a logical thing to say? Dave M: I mean if you’re them it’s absolutely a logical thing to say. But I mean there’s an interesting thing and I think the Tribune had a piece a few days ago that looked at some of the suburban school districts and how it’s written into all the teacher contracts that the various school districts are going to be paying the employer share of that and not passing it on to the teachers, so it is a bit of a double standard. 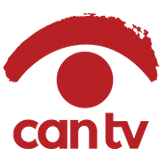 Ken: It is especially – I have lots of friends on CTU who are not going to like hearing this, but when the Unions say ‘hey, this is all on the government because we made our payment every single time. It was the government that was on pension holiday.’ Well yeah, except that that was taxpayer money that was coming in to make those pension payments. You weren’t paying them out of your pocket. Ken: And that’s what makes this so complicated and not just so black and white that there are just a bunch of villains here. Because during some of these years I mean if you think about it there was an astounding building boom in Chicago for the public schools. Beautiful new buildings were built and a lot of older buildings were rehabbed, so there was a lot of money spent, appropriately so, for this. But again, what it comes down to is well if we could just put that little pension thing off for another 20 years we could use that money now. Dave M: It’s so easy to do and you can understand why that behavior happens if you’re on a state legislature or city council or whatever because you’re not going to be around when the bill comes due. And what you have to face is that immediate need to make sure the school is open on time or that people have a contract to work under. Ken: So talk to me about Rahm Emanuel. I’m baffled by Rahm Emanuel and all of this. He appears to be engaged but then I’m not seeing – again, this is easy for me to say, but I’m not seeing what appears to me to be clever leadership on this. We think about him as being the guy who was with the DNCC who was the arm twister in Congress who could make all things happen and he’s reminded us many times of how effective he was. So why isn’t he more engaged in Springfield and saying – this is what you are going to do? Dave M: Well because I think he still doesn’t have the gravitas that a Richard J. Daley had. Richard J. Daley could order up something like that. Dave M: Correct, and you know to some extent Richard M. Daley, but Richard J. Daley set the template. You know and Emanuel during my time there Emanuel came to visit I believe one time. And even Richard M. Daley would make it a habit every year of at least coming down once in May and opening up a big tent, Taste of Chicago tent. It was really kind of the goodwill, and with Rahm it’s much more kind of behind the scenes, on the phone, meetings in his office, stuff that we don’t see out in the open often. Ken: Does this lead you to a conclusion that he’s decided that it’s just not possible and he’s not going to spend political capital on it? Dave M: You mean on the pension question about how to solve it? Dave M: You know in terms of the state pension problem I would guess he views that as somebody’s else’s problem. He’s got his own problems with the various pension funds on his watch, and what’s pretty clear is as long as there is the dysfunction in Springfield between Governor Rauner and Mike Madigan, you know Rahm has to be on the sidelines like the rest of us. I mean those two have to get on the same page before there can be any kind of movement on some of these other problems that the state faces including local pensions. Ken: I just thought that he was going to be the perfect logical connective tissue between Rauner and Madigan, that he would be able to sit them both down and just say, “Shut up, do this.” Apparently that’s not the way it works though. Dave M: That would be nice, but I mean don’t forget in Rauner and Madigan you’re dealing with two exceptionally strong-willed people, and Rahm is that way too, but Rauner is not accustomed to taking orders from anybody, nor is Madigan. Ken: Right. None of them are. None of them have ever had the experience of having somebody say no. Ken: Especially our delightful governor, which again is sort of like the whole thing about him leading toward…just bankrupt it, because that’s the way he handled businesses, right. Come in, bankrupt it, you take the money out, you reconstitute things and you take the profit out and you move on. Ken: And guess what, this doesn’t work quite that way. Ken: You did another piece recently for Chicago Magazine, grading the governor, and I just thought it was… It’s been about a month and a half ago. Ken: So maybe your grades have changed, but you gave the governor a C+ average although I find that kind of deceptive when you add all the things in because you gave him a D for fixing the budget, a D for playing well with others, a D for reforming pensions. The only thing he got an A on was taking on the Unions. Dave M: Well he deserves an A for taking on the Unions. Ken: Yes he does, I agree. Dave M: He came into office at every opportunity saying he was going to do that. Now has he succeeded in getting concessions from them? Has he succeeded in changing the landscape much with them? No, not really, but I think what you have to measure any governor on is what’s the product. And at that point in time when I was looking at him, you know I went back all the way to Edgar in 1991 and the first six to seven months in office, that’s that honeymoon period that new governors have and goodwill is out there, and I just looked at kind of what did they all get. And when I did the piece for Chicago Magazine at that point Rauner the only thing really that he could point to was he had kind of patched together a fix to the fiscal ’15 budget and he had signed off on the legislation for the Obama Library in Chicago. Two things that in the broader scope of our problems don’t seem to amount to much. You look at other governors you’re talking multi-billion-dollar capital programs. You’re talking about under Blagojevich there was all this pent-up social stuff that was done. Ryan had a first 100 days that would blow you away and even Edgar. Edgar had, in 1991 when he first took office he had a democratic-controlled Senate and House and he was able to wrest a lot out of Madigan then. I mean he got property tax caps. He got the education piece with the income surcharge back then extended permanently, two major concessions that he got in a budget stalemate then. Ken: I think that’s what’s been one of Edgar’s frustrations, right, is looking at this and saying why can’t you do this? I won’t say it’s not hard but it’s doable, even if you’re on opposite parties you can get some of these things done. Dave M: Rauner as much as he went after Unions he also went after Madigan, and since being elected those attacks against Madigan have not stopped. And you know most of these people who after they get elected there’s a certain pragmatism that takes hold because they know that they have to get things passed through the House, and starting with a budget. And if they don’t get just those basic things done they don’t get anything else, and I think that’s the challenge for Rauner going forward. Ken: So Dave what happens now? I mean we’re, I don’t know how many months into this; we have no budget. The courts are basically running the state as I see it now because the different…people go to court and say ‘I need this money’ and the court says ‘Yes, you can be paid,’ and then the comptroller says, ‘Well we don’t have a budget; we don’t have any money.’ This is insanity. Things are always wacky in Illinois, but this is a level of wackiness that’sunprecedented. Dave M: I think most of government now is functioning one way or the other with the exception of the human service people. Their money is still being held up and that’s the choke point here, and that’s where I think Rauner is hoping to leverage movement by the democrats on some of this turnaround agenda that he wants. And on the flip side, the democrats are saying look, we’re not going to let you gore labor unions or the trial lawyers and we’re prepared to just wait and let you take ownership of this. And so I don’t know. I think under Blagojevich in ’06 if I’m not mistaken we had an impasse that lasted all the way into November until we had sort of a final conclusion on the state budget. And I would not be surprised to see us go to that point if not beyond this year. Ken: You know I had really intended for us to spend a good deal of time on the show today talking about the schools’ funding inequity, the systemic inequity that exists in Illinois that sets us apart from so many other states, but we really don’t have quite enough time for that and I’m hoping maybe sometime we can get you back just to talk about that. Ken: Because that is a really interesting thing. But in the meantime, we just saw the Board of Education yesterday, CPS Board passed unanimously, as always, the budget. And if Blagojevich introduced the concept of borrowing his revenue the CPS has introduced a whole new thing of fantasy budgets. I mean this is like an entirely new concept. Oh there’s 500-million in there. Trust me, it will come sooner or later maybe, and if it doesn’t how many schools do we have to close? What do we have to do? Well don’t worry about it; we’re going to get it somehow. So this is the kind of game that the mayor and the governor and Madigan are playing with each other. They’re just playing chicken on this stuff. Dave M: That’s absolutely right and as a result the state and these… Mark Brown, my former colleague at the Sun Times had a brilliant column today. Ken: I highly recommend it. Dave M: Yeah. It was about the effects of all this on a family with a developmentally-disabled child and those are the folks that are on the front lines here being subjected to this nonsense. Ken: It’s cynical to say but it’s almost as though the governor said, “Well now here’s some sympathetic people who will get media attention. If I screw them then maybe the others will come around and give me what I want in the Union deals.” I don’t get it. I really honestly don’t understand it, but you’re the guy who has been around. You were in Springfield for 19 years or whatever it was, so if you don’t understand it I know I won’t. Well we’ve run out of time, as we always do. Dave McKinney it was really a thrill having you on the show today because you really are one of those people who have just been around and seen it all and you’ve written so beautifully on it for so long and I hope you will still continue to write in Chicago for a long time to come. Dave M: Thanks Ken. That’s really nice of you to say. This entry was posted in Chicago Newsroom past shows and tagged 3% compounding COLA, Dave McKinney, Governor Jim Edgar, Governor Jim Thompson, Governor Pat Quinn, Governor Rauner, Governor Rod Blagojevich, pension holidays, pension ramp, Rahm Emanuel, Springfield. Bookmark the permalink.